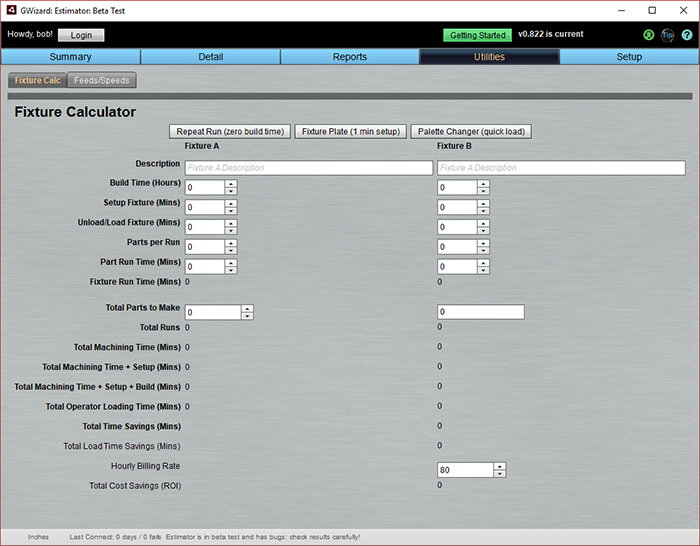 G-Wizard Estimator is designed to save you time by making it easy to do feature-based cost estimation using the same Feeds and Speeds engine that’s built into our G-Wizard Calculator. This page provides a written overview. G-Wizard Estimator has not yet been formally released, so all you need to do to use it is have a valid trial or subscription of our G-Wizard Calculator software. Be sure you’ve also registered for G-Wizard Estimator on its home page. Click here for the G-Wizard Estimator Download Page. Since it uses so much shared technology with G-Wizard Calculator, we recommend you start by doing a Trial of G-Wizard Calculator if you’re not already familiar with it. That’s the easiest way to learn the CADCAM, Feeds and Speeds, and most of the Setup options for G-Wizard Estimator. Once you have mastered those concepts, the rest of GW Est is easy to add on. To login, you’ll need to use the Login Bar. 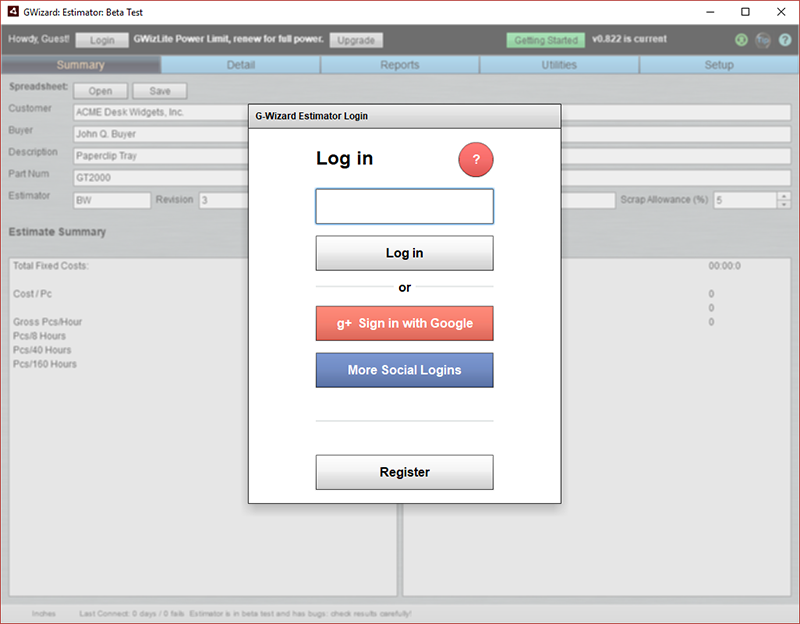 – Login Area: You can press the login button to logoff or change your login. – Getting Started: This button takes you to this page. – Version: This message area will tell you whether the version you’re running is the latest or not and what that version is. If there is a newer version available, there’ll be a button to take you to the download page. – Feedback: This button lets you give us your feedback about G-Wizard Calculator. We love getting feedback, good or bad–we just need to know what you need to make GW a better product. – User Club: Takes you to our online forums where users can exchange information and get help. – Support: Takes you to our online support site where you can file a trouble ticket, consult the FAQs, or vote on ideas for what features we should build next. – Help: Takes you to an online help page that we think is relevant to the applet you’re in. The list is in the column on the left with links. – Tips: This pops up our Tip window which gives you tips on how to get more out of G-Wizard. Note the tabs across the top. These are the Applets that make up G-Wizard Estimator. Let’s do a quick overview of each of their functions. The Summary Applet is where you enter basic information such as who the quote is for. There’s also a summary that rolls up all the costing information for the quote. Variable Costs: These are per-part costs. Fixed Costs: These are one-time costs, such as the cost to build a fixture for the job. They’re pretty similar. The big list at the bottom of both views is where we enter Operations using the “Add Op” button. If you have a big screen or multiple screen setup as many do for CADCAM, you can drag the Add Op window so you can see both the Detail and the Add Op at the same time. The Operation Type is select via the category list in the top left and a list of Sub-Ops that goes with each. Each time you create a new Operation, click the “Save Op” button at the bottom and keep going. When you’re done, click the “Close” or the “X” at the top right. We’ll cover each Op Type in detail down below. 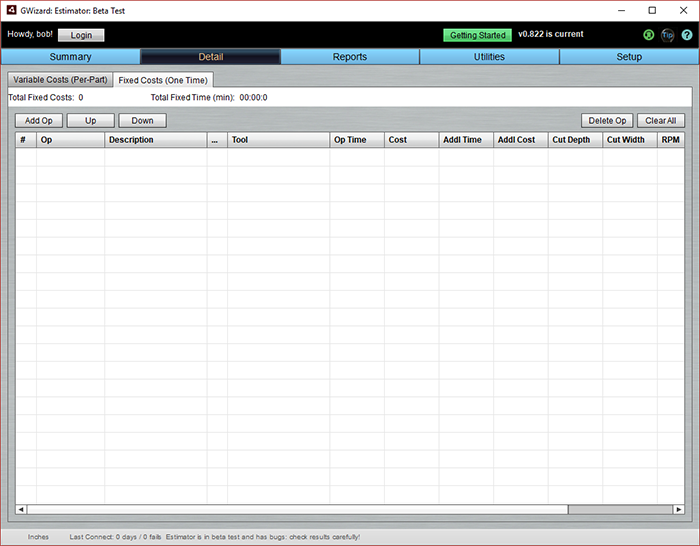 The Reports Applet lets you generate various kinds of reports. It’s not yet operational, so we’ll talk about it once it’s further along. For more on how to use the Fixture Calculator, check out our article on it. The purpose of the Fixture Calculator is to help you decide whether building a custom fixture for your Job will make it more profitable or not. Let’s go over the function of each tab. 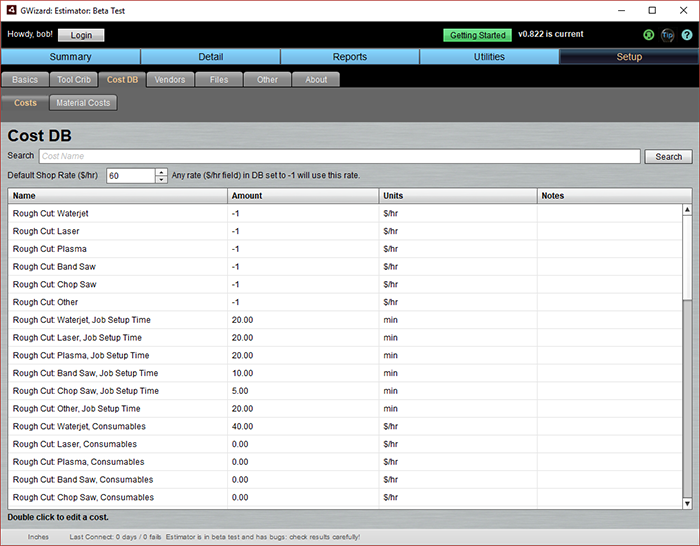 On the Basics Tab, you can define new machine profiles that match the different machines in your shop. You can also calculate an hourly cost for each machine. 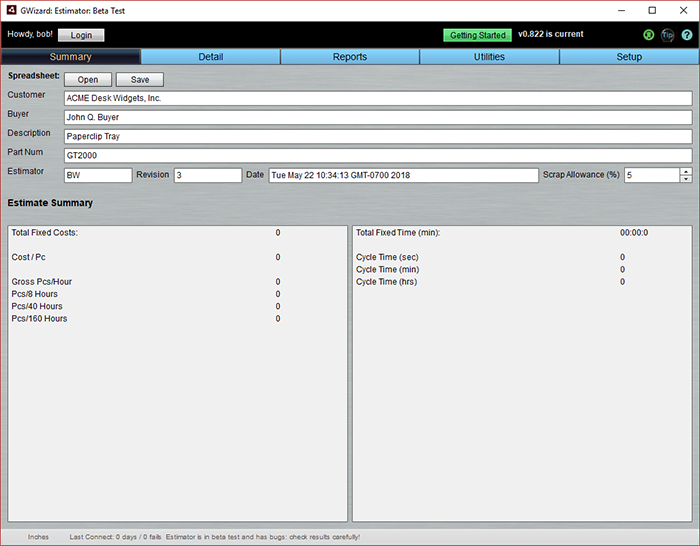 The Tool Crib lets you setup predefined tools and is shared with GW Calculator and GW Editor. 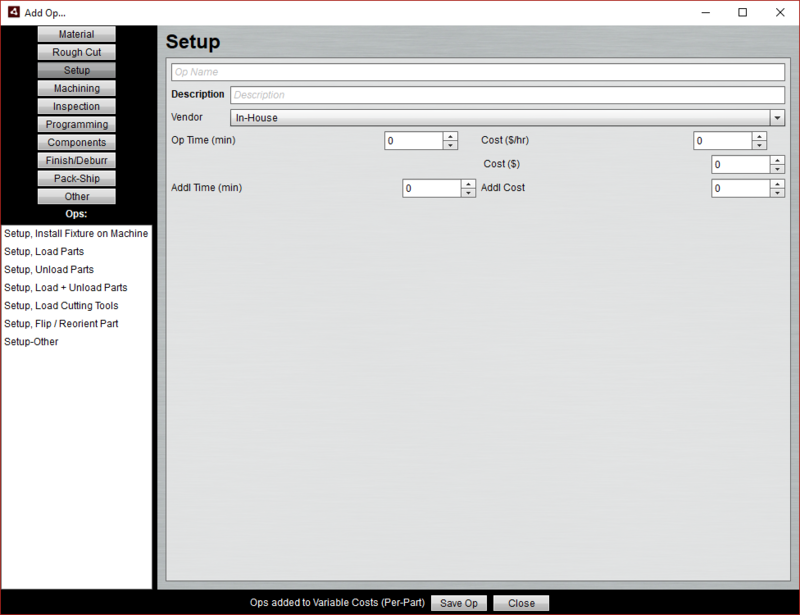 To learn how to create Machine Profiles or manage the Tool Crib, visit the documentation for G-Wizard Calculator. It works exactly the same because Estimator uses Calculator’s Feeds and Speeds Engine internally. Think of each row in the Cost DB as a pre-defined variable that has a name, a value (Amount), some sort of Units its measured in, and Notes you can add for explanation. Many of the values are hourly costs, and these are handled in a special way. You can enter an overall Default Shop Rate at the top. If an hourly cost variable (you can tell a variable is hourly cost because the units are $/hr) has a value of -1, the Default Shop Rate is used instead. In addition to hourly costs, you find a lot of variables tell you how much time a particular op will take. 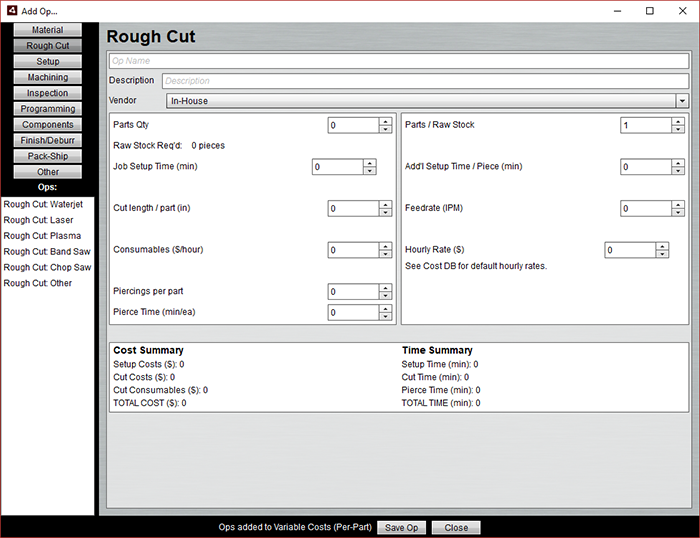 For example, to rough cut parts on a Waterjet takes a 20 minute Job Setup Time. To change any of these variables, click on the row and then double click on the value to edit it. The Files tab helps you find your Preferences Folder. 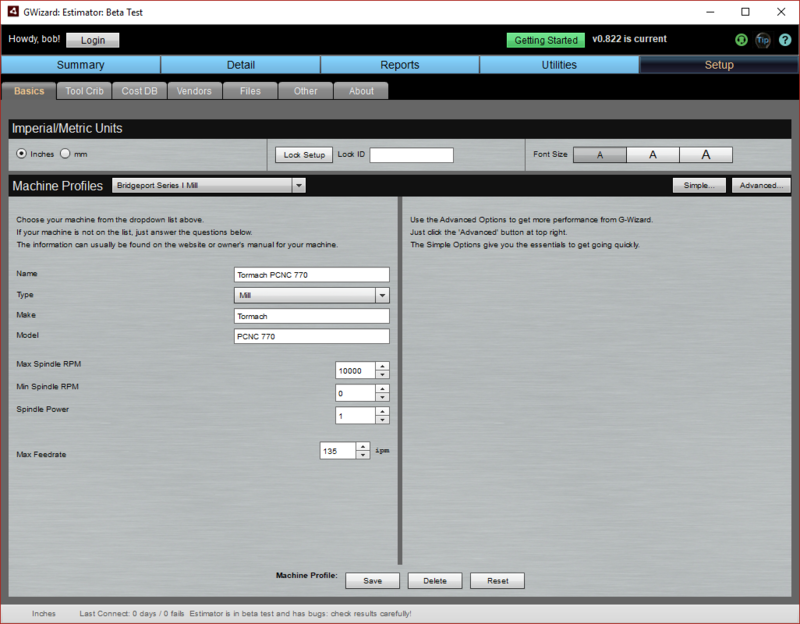 It also allows you to set up Sharing so that more than one G-Wizard application or user can share information like Tool Crib, Machine Profiles, and Cost DB. Any quote consists of a bunch of Operations. Some are allocated per-part (charged against each part) while others are one-time and are only charged once for the job. In this section, we go over all the Op types. The Material Op is for purchasing raw materials to make your parts out of. It’s based on G-Wizard’s Weights and Volumes Calculator. 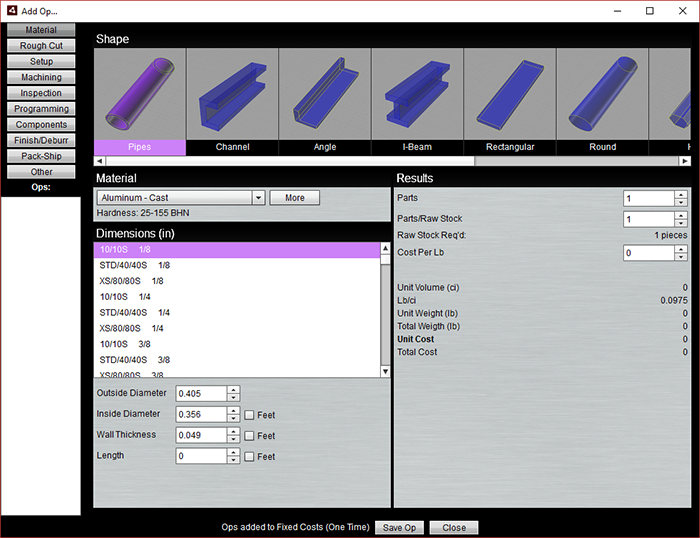 Just select a Material, a Shape, and either choose a standard dimension or enter custom dimensions. Next, enter how many total parts you’re making and how many parts per piece of raw stock. From that, it will figure how many pieces of Raw Stock are required. The last input is the Cost per Lb for that Raw Stock. G-Wizard will look up the default for that from the Cost DB or you can override it with the variable here. Having purchased raw material, you may need to further cut it up with a Rough Cut Op. 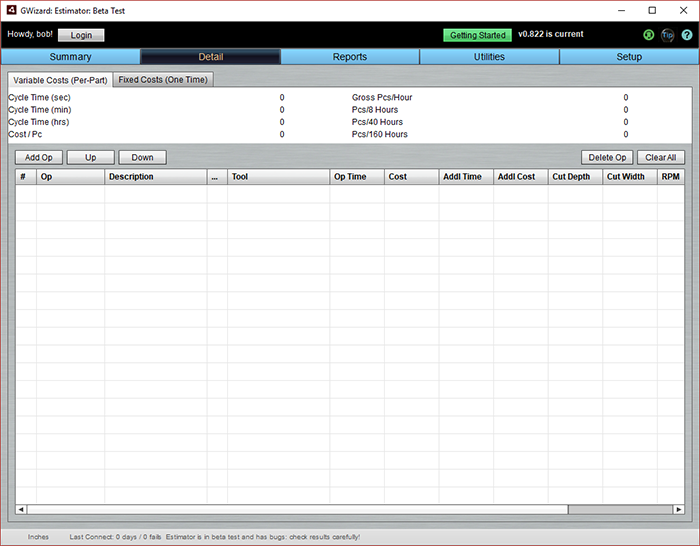 A variety of processes are available using the Sub-Op menu in the lower left. For example, you could choose to Waterjet, Laser, or Bandsaw cut your pieces. From there, the calculator will arrive at time and cost for the Op. Press “Save Op” when you have it ready to enter. Each Machining Op corresponds to a typical feature you might program in your CAM software. 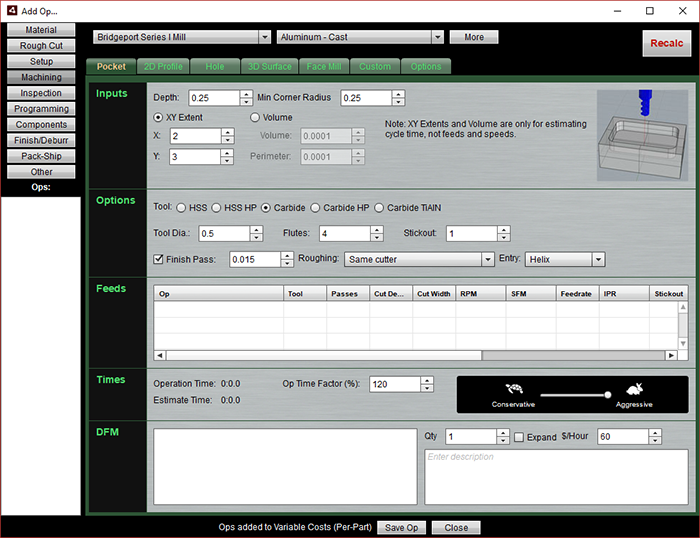 This op uses the G-Wizard Calculator Feeds & Speeds Engine to generate Real World estimates for what the op will take. 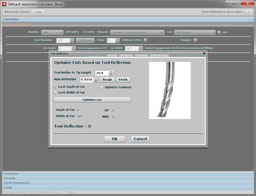 For more information, see G-Wizard Calculator’s CADCAM Wizard documentation. Or check out our Video University series on CADCAM Wizards. Programming is typically something you’d put into your Fixed Costs since it is usually done once for the whole job. You can have the Programming Op count the features in the quote (i.e. 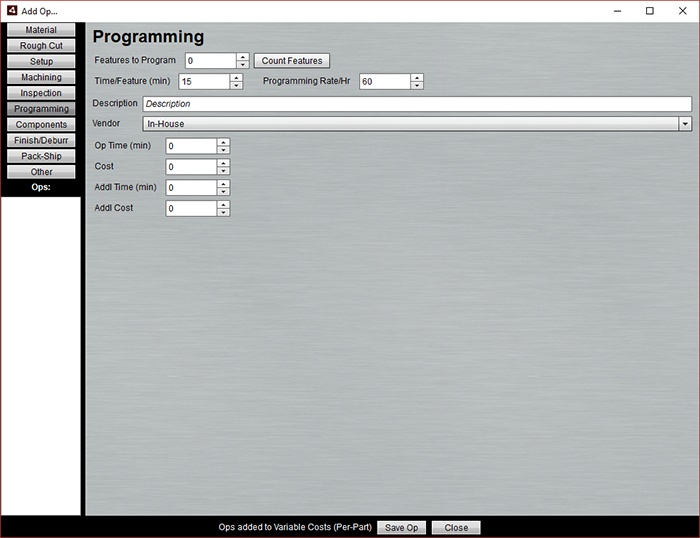 the Machining Ops) and calculate the Programming Cost based on a fixed programming time per feature. What differs is the list of Sub-Ops on the lower left.